Hot off the heels of NVIDIA announcing the GTX Max-Q design, ASUS is announcing the latest laptop in their Republic of Gamers lineup, with the ROG Zephyrus GX501VI and GX501VS featuring an Intel Core i7-7700HQ and NVIDIA GTX 1080 Max-Q in a design which is less than 1.7 cm thick, and weighs in at only 2.2 Kg. Although not everyone needs to go thin and light, those that do will appreciate even more performance in a new slim laptop. ASUS has a great lineup of gaming laptops, with everything from low cost, to desktop replacement designs. 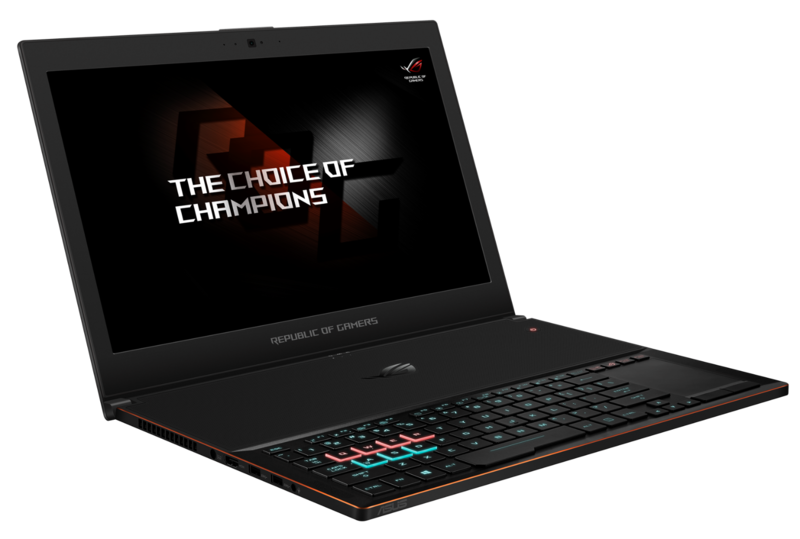 The ASUS ROG Zephyrus takes the high performance premium segment to a smaller, lighter design. Thanks to the GTX Max-Q GPU launch from NVIDIA, some better binning, coupled with lowered GPU frequencies, bring most of the performance of the GTX 1080 to even smaller notebooks, which would have struggled to dissipate the heat generated by this graphics solution without the larger volume for cooling a larger, heavier laptop provides. ASUS isn’t the only one to bring GTX 1080 to a thin and light design, of course, and the key will be their cooling implementation. ASUS is touting its Active Aerodynamic System (AAS) to keep the laptop cool and quieter, and when the Zephyrus is opened, the chassis actually opens up slightly to allow greater airflow in without sacrificing the laptop thickness when it’s closed for travel, and ASUS says it allows 20% more airflow with this flexible design. Other thin and light GTX 1080 designs have been pretty loud though, so hopefully the combination of Max-Q and AAS can keep the noise levels under control. 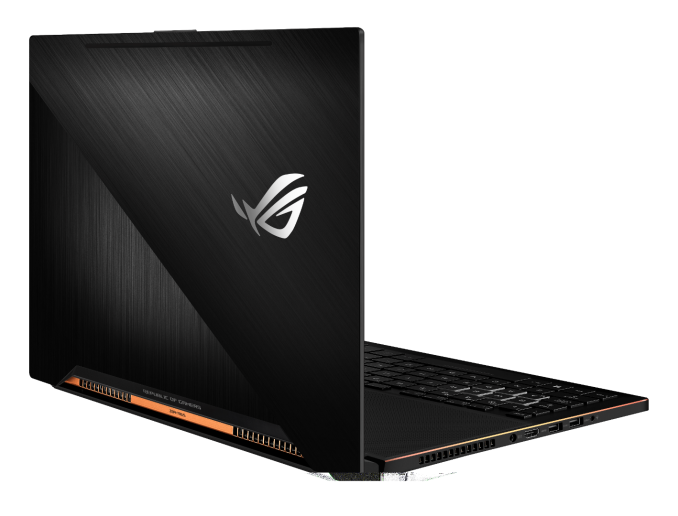 The ROG Zephyrus features a 15.6-inch display, with a 1920x1080 resolution and 120 Hz refresh rate, and it features NVIDIA G-SYNC. Honestly, at this resolution, the GTX 1080 is generally overkill, but at least the high refresh panel should help it there. ASUS claims 100% sRGB coverage, although they tend not to worry much about panel accuracy and grayscale, so hopefully we can check it out. The rest of the laptop is what you’d expect with plenty of mobile performance. Intel’s Core i7-7700HQ provides the processing grunt, and ASUS will pair it with up to 24 GB of DDR4-2400. Storage is all M.2 PCIe based SSDs with 256GB/512GB/1TB options. ASUS has been big on the Thunderbolt train, and it’s nice to see that the Zephyrus continues this trend with one USB-C port with Thunderbolt 3 and USB 3.1 Gen2, and because that’s more the future and less the present, they also include four USB 3.1 Type-A ports. HDMI 2.0 is also available so this laptop should be VR ready if you’re into that. ASUS has moved the keyboard to the front of the notebook, which helps with their cooling and makes it feel more like a desktop system, and the keyboard features RGB lighting which appears to be in zones rather than per-key, although they do have customizable effects for the WASD and QWER key groups. As a gaming notebook, it also features anti-ghosting keys which can support up to 30 keys pressed at the same time, in case you sprout a whole bunch more fingers. 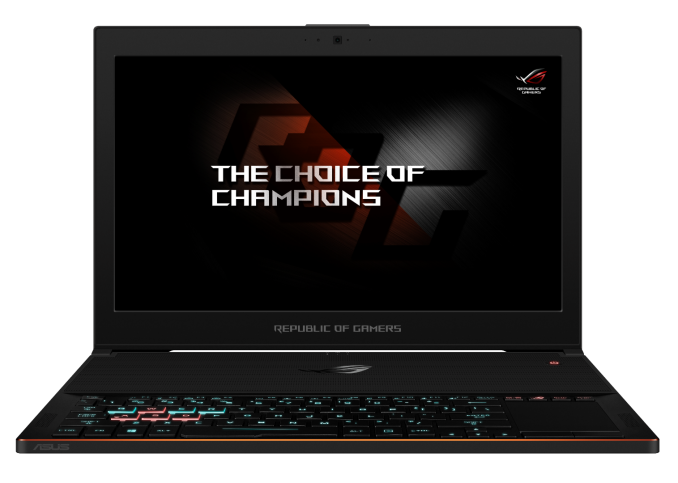 The ROG Zephyrus will be available at the end of June in the USA and Canada. The GX501VI model will start at $2699 USD, and the GX501VS will start at $2299. ASUS doesn’t specify what the two models designate, but the VS likely downgrades the GPU to a GTX 1070. $2699 is just too much money. again, no-go fat ugly bezels. Asus must be using the 90W variant of the GTX 1080, which has to be not insignificantly slower than the 150W variant. Still impressive nonetheless - you'd expect about an 80W GPU of a 2.5 kg 15.6" laptop, and Asus has managed to up the power budget by 10W and cut the weight by 300g. Impressive as the engineering is, the styling is not quite there, especially considering the price. They could've at least tried to improve the bezels.